Cairngorm, S.Y., 81 tons. Mrs. Robertson-Aikman. Was born January 5, 1841, and educated at Belfast Royal Academical Institution. Sir Hugh is a well-known figure on the Clyde and North of Ireland. 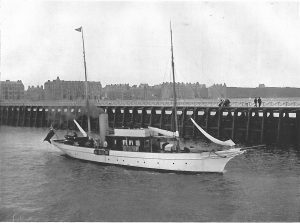 In 1904 he was elected Commodore of the Royal Clyde Yacht Club, and he has held that position since. He owned the s.y. Cairngorn, the s.y. Latharna, and the s.y. Fire Fay. Clubs: Royal Clyde, Royal Largs, Royal North of Ireland, Royal Ulster, and Royal Northern. Residences: Drumalis, Larne, Co. Antrim; and Gallow­hill, Paisley.